CloudAhoy is a powerful app that makes it easy to record and play back all of your flights. Ideal for student pilots, instrument pilots, CFIs, or anyone who wants to be a better pilot, the app goes beyond a simple 2D map, with chart overlays, glass cockpit gauges, altitude graphs and much more. Flight recording is easy with the iPad’s built-in GPS or an external device like a Bad Elf GPS or Stratus ADS-B receiver. 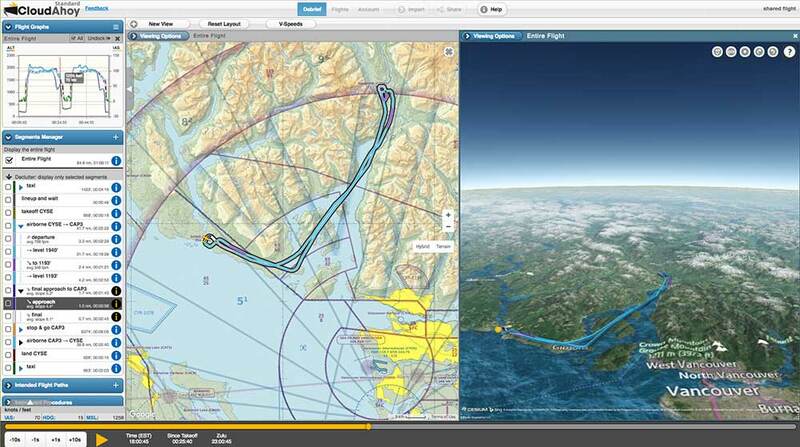 Also accepts ForeFlight track logs – simply export from ForeFlight directly into CloudAhoy. Works with Stratus 2 and Stratus 2S AHRS! Using Stratus's built-in attitude heading reference system (AHRS) and its automatic flight data recorder, you can save every flight you make with a Stratus 2, 2S, or 3. Simply transfer your flight log from Stratus to ForeFlight, then upload it to the ForeFlight online track log library. From there, you can quickly import all track log data (including attitude) into CloudAhoy. Details here on importing track logs from the web. 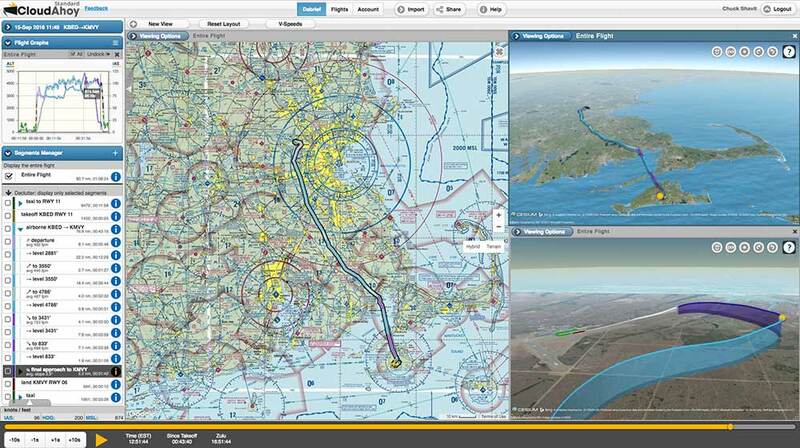 CloudAhoy is being used by students, professional pilots, CFIs, military and GA. They fly fixed-wing, rotorcraft and gliders. It is used to debrief VFR and instrument training flights, cross-country trips, and special missions such as search and rescue. It is used by recreational pilots for sharing flights with their passengers or friends. Many CloudAhoy users routinely record every flight so that the unexpected can be studied. 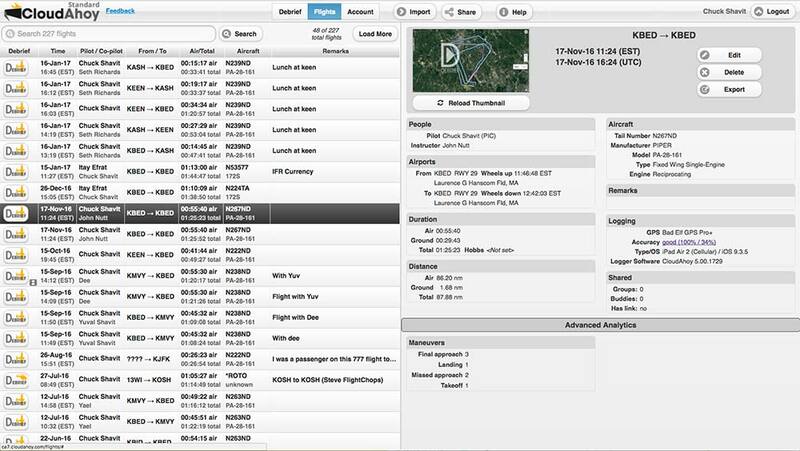 CloudAhoy combines the data captured during the flight with data from other sources including weather, airport data, instrument approaches, aircraft registry and more. Its rule-based knowledge engine has information about aircraft flight characteristics, and how specific maneuvers should be flown. 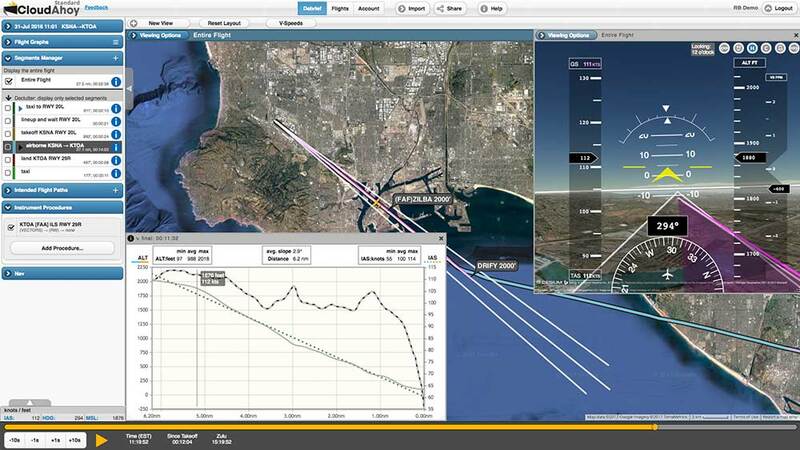 For example, CloudAhoy understands traffic patterns, steep turns, chandelles, missed approaches, autorotations, and thermalling. 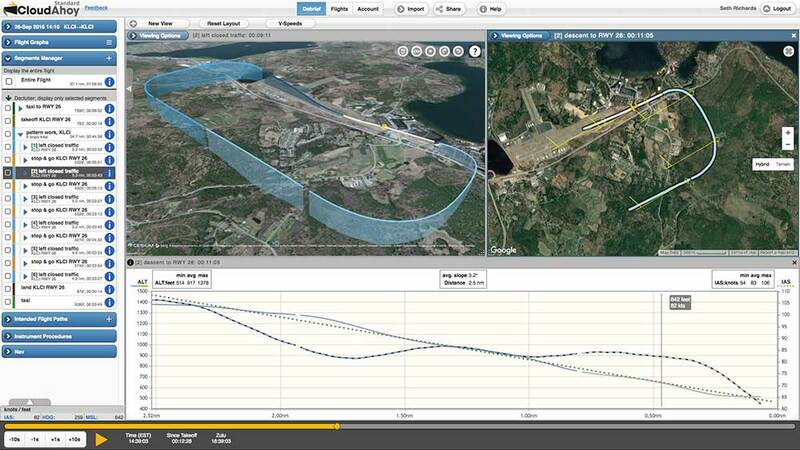 CloudAhoy integrates this to provide pilots with clear and precise information about the flight’s stages. The user interface is designed to enable detailed analysis with clarity and ease. And with fun. Flight sharing between CloudAhoy pilots, and people without an account. Flight logging, listing and viewing is free. Debriefing service (on Mac, Windows, iPad and Linux) costs $66/year. After creating your account, run this app and login to your account. Enter your plane’s tail number and your name, tap START, and takeoff! When you’re back on the ground, your flight data is automatically sent to CloudAhoy’s server, the data is analyzed, and is waiting for you to login and debrief. After you land, login and debrief your flight. You can debrief directly in the iPad app, or on any computer platform including Mac, Windows and Linux - via CloudAhoy.com. You can share flights via links in email, Facebook, or post in a blog. 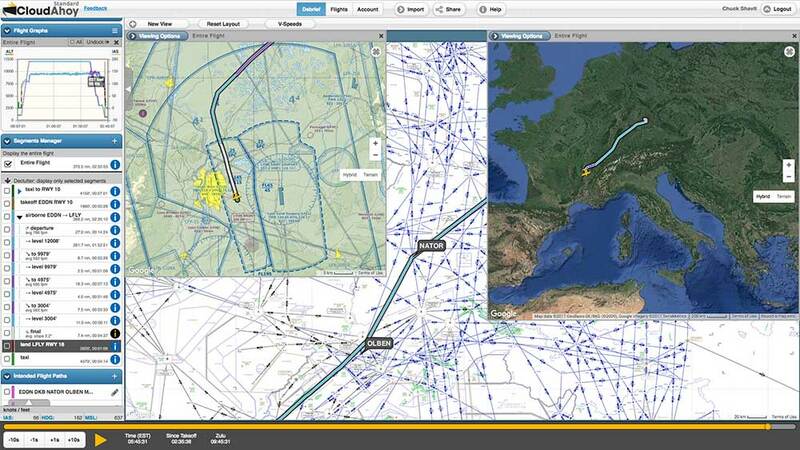 Flights can be shared automatically between the pilot and the co-pilot. CloudAhoy allows you share flights with multiple CloudAhoy buddies of yours and with CloudAhoy groups. Can I put multiple tracks up at the same time? For example, if I’m flying in formation, can I see both aircraft at the same time? BEST ANSWER: I know it's a very capable platform, allowing syncing of video with flight tracks, but I don't have any experience trying to combine two tracks. I certainly see the advantage of having this for formation flight, so hope they can or will have this ability. I think that's a question for Cloudahoy technical support.